I am concluding week one of The Future of Story Telling, a Massive Open Online Course (MOOC) offered by iVersity. This free eight-week course consists of a series of videos augmented by quizzes and linked material. The course also includes “creative task” assignments each week. The first creative task requires us to tell about a book that impacted our lives. As a life-long enthusiastic consumer of storytelling, I never imagined struggling so hard to find my topic for this creative task assignment. But, struggle I did; my brain just flamed out. I finally started free writing about stories I remembered reading and enjoying most from my childhood. The Life and Adventures of Robinson Crusoe is the story I kept coming back to as I worked through this process. 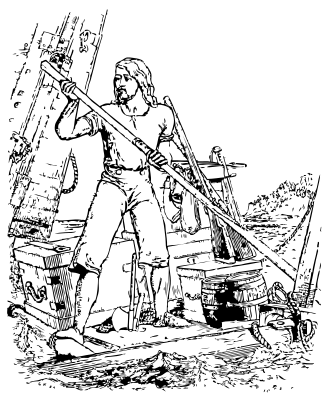 Robinson Crusoe, by Daniel Defoe, entered my reading life early. The story, about a man shipwrecked and on his own and the ways he coped as a castaway on a remote island (this was pre-Gilligan, folks), fascinated me. I’ve always been a “re-reader” and this is a book I revisited often. Numerous scenes stand out in my memory: Robinison’s salvaging what he can from his wrecked ship and then again from, at least, another later shipwreck (I haven’t re-read it in a while and can’t remember if there was more than the one additional wreck later in the book); his building the large dugout canoe only to discover, when finished, it was too large to move to the water (even as a child, I related to grandiose projects gone awry); building his fort and digging out a cave (we won’t talk about Dad’s reaction to the hole I dug in the back yard) and, subsequently, planting so many trees around his fort that they became an impenetrable forest. All of these scenes excited my imagination. Defoe’s depiction of a castaway making do with only the things he had at hand, or made, certainty channeled the Walter Mitty (who is still alive and well) in me. The later appearance of Friday and the subsequent rescue of Friday’s father as well as, eventually, Robinson, held a lesser appeal to me then. I was more interested in the guy on his own, all by himself, and his story of how he got by. The appreciation of Defoe’s nuances regarding loneliness, class, and race only emerged later as I re-read the book when I was older. At the time, probably around eight years of age or so, Robinson Crusoe was just a fun read that stuck with me through the years. Robinson Crusoe. Cap’n was right. It was a good one. It wasn’t long before a full, unabridged copy of Robinson Crusoe arrived in the mail. My dear parents, now long since at rest, never considered books a luxury. Toys might have to wait for birthday or Christmas; books seemed to just appear. Frequently. Robinson Crusoe was also my gateway drug book to other stories such as Wyss’ Swiss Family Robinson, Stevenson’s Treasure Island and Burroughs’ Tarzan of the Apes. Defoe’s work certainly wasn’t the first book I read, but his story is the one I remember the most as immediately enthralling me and inciting a passion to find other stories that evoked similar emotions. What stories resonate through the years for you? Please share your thoughts in the comments. If you are interested in the The Future of Storytelling MOOC, click on the link for the course’s iVersity page. You can also follow on social media by going to Facebook or going to Twitter and following @StoryMOOC or search on #StoryMOOC. I’ll be hanging about on Twitter as @ponderingcreek.